The Estate is delighted to have received Planning Consent for the redevelopment of the Old Brickyard Caravan Site in Wisemans Bridge. 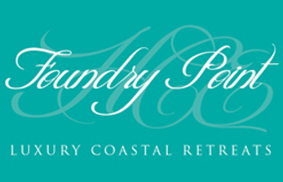 Now being re launched as ‘Foundry Point Coastal Retreats’ (with reference to the site’s previous use as an Iron Foundry) we are in the final stages of satisfying planning conditions, and hope to start construction in early 2019. The stunning position of this site, perched on the sea wall at Wisemans Bridge, will provide the perfect location for a collection of exquisitely designed and luxuriously appointed double occupancy holiday units. A completely level and easy walk along the old Tramway leads through the tunnels to the Coppet Hall Beach Centre, and Saundersfoot beyond. In the opposite direction, the Wisemans Bridge Inn is located just a stones throw away across the seafront.